Jeiwsh Home leader supports religious freedom on the Mount, but backs PM decision to keep 'status quo' banning Jewish prayer. Education Minister Naftali Bennett (Jewish Home) supports full freedom of religion on the Temple Mount, he affirmed Monday, as well as the controversial agreement between the US, Israel, and Jordan to place CCTV cameras at the site. 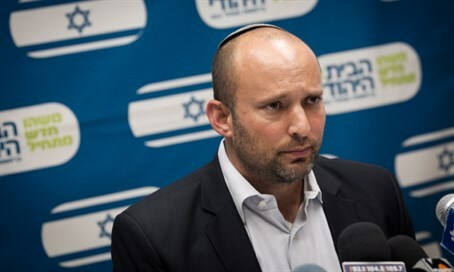 "I am for freedom of worship for all religions everywhere and back the move by the Prime Minister regarding the preservation of the status quo on the Temple Mount," Bennett stated, during a visit to Ben-Gurion University of the Negev. "I see a blessing in the use and operation of cameras in place 24 hours a day, and for everything to run there openly and transparently." Bennett qualified, however, that the issue is "complex" and that the cameras themselves will not solve the issues on the Mount. Bennett's statements are somewhat surprising, given that the status quo on the Mount includes barring Jews from praying at Judaism's holiest site and severely limiting visits - a position several lead ministers and MKs from his Jewish Home party, such as Agriculture Minister Uri Ariel, have steadfastly opposed. Netanyahu has insisted that the cameras, which were agreed upon in a surprise deal Saturday night, "are in Israel's interests." Despite this, the decision has drawn intensive criticism both over the decision to continue the status quo and suspicion that Jordan and the Palestinian Authority (PA) would exploit the cameras for their own interests.